Re/code says Apple will show the world its newest iPad updates on October 16th. Rumor has it a new Retina iMac will also make an appearance, as will the public release of OS X Yosemite. Apple will use the event to reveal two new iPads—the sixth-generation full-sizer and the third-generation iPad Mini. 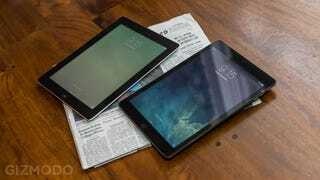 Reports indicate that Apple may jumbo-size the iPad all the way up to 12.9 inches, to compete with bigger tablets from Samsung and keep with the make-everything-bigger mentality of the iPhone 6. The biggest iPad (perhaps named iPad Plus?) would slot in above the current 9.7-inch iPad Air and 7.9-inch iPad Mini. Other expected iPad updates include boosted processors and the addition of the Touch ID home button that first showed up on the iPhone 5S. There's also speculation of a new anti-reflective screen surface, as well as a goldpagne-colored iPad, if you're into that sort of thing. On the iMac front, Apple is expected to bring its Retina display to the desktop, with a rumored 5K (5120 x 2880) screen anticipated for the 27-inch model. Historically speaking, iPad events are a bit smaller and more subdued than the frenzy that is iPhone Day. Maybe don't anticipate an impromptu U2 concert—but if the rumors hold out, we may see some pretty significant changes to Apple's tablets.